‘Love Suicides at Amijima’ is one of the most famous ‘domestic plays’ (sewamono) of the kabuki theatre. One of the three main categories of kabuki play, sewamono portray in relatively realistic fashion the life of the ordinary people of the Edo period (1600-1868). 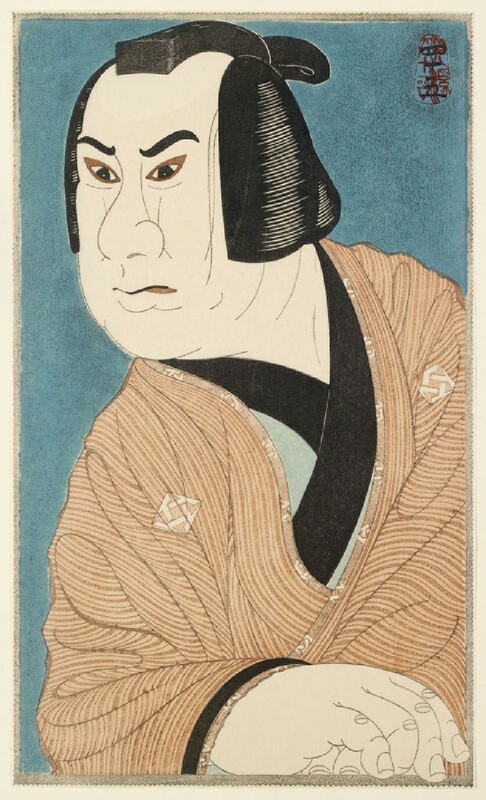 This print depicts the protagonist of play, the paper merchant Jihei. Although Jihei has a devoted wife and children, he falls in love with Koharu, a courtesan from the Yoshiwara pleasure quarters. In this scene Jihei sits at home pretending to sleep, but his eyes are full of tears thinking about his lover.